I am happy to report that the baguette pan, Chicago Metallic French Bread Pan, has been thoroughly christened and the vote is in, the pan is a keeper!! MBH says these were the best baguettes I have made to date and I have to agree. The crust was crunchy and snapped when we tore into the first one. 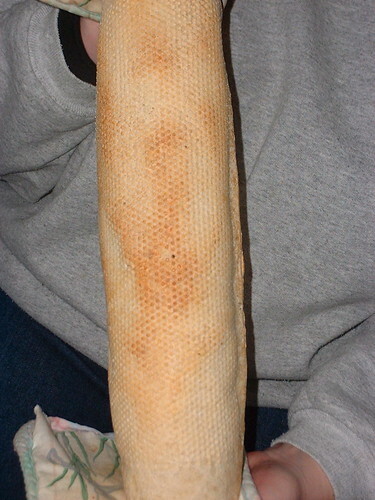 The inside was chewy and the texture was exactly like the baguettes we get from the local bakery. The baguette, complete with pan textured back! Here is the recipe for these Sourdough Baguettes. This recipe is based on one from Mike Avery of the Colorado High Attitude Bakery and his excellent webpage about sourdough, the Sourdough Home. I adjusted the amount/type of flour he uses in his basic sourdough recipe and the amount of starter to account for differences in altitude/tastes. Combine the starter, water, the all purpose flour and 1 cup of the bread flour in a large plastic container with a lid or a large glass mixing bowl/plastic wrap. Let set over night or 8 hours in a warm place (70 degrees). Combine the sponge, salt and 3 cups of the bread flour, one cup at a time in a large mixing bowl. If you are using a stand mixer, use low speed. If by hand, you may need to use your hand with the last cup to mix. If you are using a stand mixer, add remaining flour 1/2 cup at a time until you have a well formed dough ball. The dough ball will feel "tacky" but shouldn't feel wet/gooey. If it feels gooey, add more flour 1/8 cup at a time until it is tacky. If you are mixing/kneading by hand, add remaining flour 1/2 cup at a time holding back 1/2 cup of flour for kneading (* when you are kneading by hand, it is easy to add too much flour and this will result in a tough baguette). If as you knead, the dough feels too wet, add flour in small amounts until dough no longer feels wet but is just tacky. Knead dough until smooth and elastic (about 10 minutes with a stand mixer, 15 - 20 minutes by hand). Note: If you are using a stand mixer, make sure you have a dough hook and a very heavy duty motor, this is a very stiff dough. Form large round ball of dough and let dough relax about 20 minutes, covered with tea cloth or plastic wrap. Divide the large dough ball into 2 equal parts. Re-cover the 1/2 you are not working with to keep it moist. 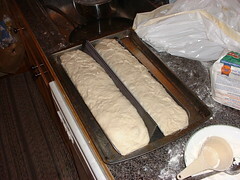 Form an even shaped long roll by rolling the dough out into a long "snake" (about 8 - 10" long). Using the side of your hand, fold the dough snake over your hand to form a half "snake" (long wise). 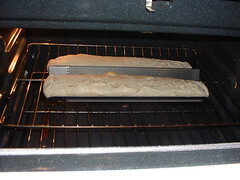 Gently roll back and forth, starting at center and working way out to ends until baguette is about 14-16" long. Do not apply pressure or your baguette will be lumpy. Place in greased baguette pan, cover with greased plastic wrap and let rise 8 - 12 hour at 70 degrees or 12 - 15 hours in the fridge (this is retarding the rise and develops the flavour of the sourdough very nicely. This will also give you that "bubbly" crust). If you placed the baguettes in the fridge, let them come to room temp (about 45 minutes - 1 hour). Very carefully so as not cause the proofed baguettes to fall, slash the bagels diagonally with a razor blade or extremely sharp knife. In preheated 375 degree oven, spritz baguettes and oven with water to create some steam (this is the secret to the "crunch" of baguettes). Bake for 35 - 40 minutes or until golden brown on outside with inside temperature of 195 degrees. Let cool for 30 minutes before eating. Baguettes are best eaten same day they are baked. Remember when I told you my back was broken? Is it bad blogger form to have two posts in the same day? Today has been a day of firsts for me: first use of the long awaited baguette pan (baguettes have just gone into the oven for those of you keeping score), first raw programming of css (thanks to MBH who is not only the world's best sourdough starter feeder but also a computer programming god/patient teacher to an inpatient student), and I figured out all by my lonesome well basically all by my lonesome, how to add links to my blog sidebar AND upload photos to my blog. As promised a few days ago, the photo of our driveway on Sunday, January 23rd AFTER the Blizzard. 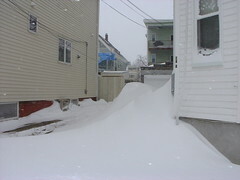 Yup, that snow drift is almost as high as our garage.... Oh our aching backs. So, we've dug out for our 32" of snow here in Cambridge, MA (Our Faire City). I've posted a picture of the monster drift between our house and the neighbors. Thank God for the modern technology of a snow blower or we might still be out there shoveling. I went back to work today to find things not as backed up as I suspected they might be or worse could have been. MBH has created a monster in me. I'm addicted to blogs. I've spent a large amount of time today and yesterday surfing for blogs to read. There are quite a few interesting blogs out there to be read. I've been reading one called This Fish Needs a Bicycle. Here I was, at work, wasting the last hour because I couldn't get motivated to design one more sound system for a friggin' restaurant so I decided to start surfing around through blogs linked to blogs. I started with on of my favourites: Cooking with Mental Office Girl, another 30 something foodie stuck in a cube farm wanting to run away screaming. Moved to What I Cooked Last Night, and somehow found myself staring at the bowl The Fish calls home. Check her out. She is up for "blog of the year" and even though I'm not sure I relate to the mid 20's lifestyle anymore, reading about her life as a serial dater reminded me of those fun, stressful, wacky years. She is currently waiting on and tracking daily the progress of her Ipod delivery and having issues with the wait. I can relate. I have the Amazon.com Track Your recent order tabbed up in my Mozilla browser tracking the progress of my Chicago Metallic Baguette Pan. According to UPS, it is on the truck and out for delivery. Oh really?? It is 9:30pm and still no baguette pan. This is the second time I have been waiting for this order. The first time, Amazon cancelled the order after 4 weeks because they could not guarantee when and if they would ever get them in again. Now, after receiving a $25.00 gift certificate from work for a 'job well done', I am waiting again. Don't these people know that pan is the answer to my baguette problem? Doesn't UPS understand that my sourdough starter is all ready and rearing to go? Don't the people at Amazon understand, I have been working on mastering the baguette for 6 months and Julia Child showed me the secret the other night on PBS? Sigh....I thought waiting was suppose to get easier with age. Update: The baguette pan arrived on 1/26/2005. The UPS guy waded up our barely passable street at 6:30pm, rang the door bell (some miracles never cease), and deposited the box on our doorstep. MBH will be dining on fresh baguettes this weekend. I'll let you know how the pan works out. Typical Saturday AM for MBH (My Better Half for those of you who haven't figured out the Three Letter Acronym) and I. We are at "Dammits", first ones in as usual, in our normal spot doing our normal thing: he, working on his computer and me, alternating between reading the paper and working on my computer. There is something comforting in a routine but there is also something disconcerting about the same routine. We, as humans, long for the security and sameness of a routine but at the same time feel the need to have something new and exciting. This morning they were playing David Bowie's latest collection of "Greatest Hits" when we walked in and at first, I found it very grating on my nerves. I was hoping for something soothing and quiet to wake up my muse as I had planned to spend the morning working on my blog and my "Plan D" (more on that later). But, now as I listen to the music of my wicked youth, I can see myself as a "rebel" in my late teens/early 20's getting ready to go waste 8+ hours at school/work, blasting David Bowie, The Church, Depeche Mode hoping the depressing idea of numbing my mind doing menial labour would be soothed by the hidden messages I was sure only "I" understood in "Major Tom" or "The Jesus Song". I can see my room at my parent's home and see my bed covered in books like Ayn Rand's Anthem, Hemmingway's The Sun Also Rises, and some collection of Beat poets and I wonder "Where is that girl now"? And you know what, I was no different than today's "rebels" despite what I wanted to believe then and what they want to believe now. They are the girls behind the counter talking about how they woke up this morning to come into work and just "HAD" to hear Davie Bowie and now Depeche Mode and the kid sitting at the table next to me wearing today's latest chic clothing (that looks surprisingly like the chic wear of 1978) working on his homework for Comparative Religions of the Middle Ages for his class in the Divinity School at Harvard. They want to make sure that they don't end up working their lives away and not making what they do matter to the greater world. That they don't end up like their parents, doing the same thing day in/day out and they hope somewhere buried deep in the lyrics of Sir Bowie or Martin Gore lies the answer to how to avoid the sameness we all crave but don't want. Pretty dark thoughts for a bright crisp winter day in Cambridge and maybe brought on by my early morning listening to Ira Glass's This American Life on NPR this morning. If you aren't familiar with this little gem of storytelling, you should check out an episode (the best of them are available for download and your listening pleasure). This week's episode is called "Plan B" and it was about people who are living their Plan B's and sometimes C's, D's, or even E's. It got me to thinking about my original Plan A and which plan I am living and is this really the plan I want to stick with (probably not). Plan A, Breadchick was to be the principal oboist for the Boston Symphony Orchestra. Seriously. I still remember when I decided that was what I was going to do. It was 1976 and I was sitting in the backseat of my parents 1973 Chevy station wagon and we were dropping my best friend Kari off at her house on a dark cold winter night after swim team practice. My hair was half frozen from the cold and Kari was telling my mom she had to practice the piano that night for a lesson and I remember feeling like I had been hit by a bolt of lightening because all I wanted to be able to do was go home and practice an instrument and I even knew which instrument I wanted to practice, the oboe. So, when my parents pulled out of the driveway I announced to my parents that I wanted to learn to play the oboe. I remember my mom looking at me in the back seat with this look of "what the hell are you talking about" and saying, "well don't you think maybe you should learn to play something else like the piano first? " I remember thinking, I don't WANT to learn to play the piano, I want to learn how to play the oboe. But, I was wise enough to understand that if you want to get what you really want sometimes you have to do something someone who is in charge wants you to do first. So, somehow, within a few weeks, my parents had found the extra money to let me start piano lessons and we had "rented" a piano from the local music store (we ended up buying that piano and it still is in the front room at my Dad's house in Illinois). Somehow within the next two years, I had persuaded my parents that I was ready to play the oboe; despite my mom's objection "because I didn't practice the piano so how was I going to practice the oboe" and a band teacher's objection because "you just don't START on the oboe". So, there I was, in 4th grade band, playing on plastic reeds on a plastic oboe sounding like some dead waterfowl that had been decomposing in some smelly backwater. Somehow my parents and the band teacher lived through those first few years and somehow, unlike the piano, I fell in love with practicing and playing the oboe. Next thing I know, I'm in high school and been playing the oboe for almost 10 years and I am on my way to Interlochen's National Music Camp (the Tanglewood for the world's young musicians) and on a collision course with the end of Plan A. Interlochen is where if you are the shark in your local pond you quickly find out if you will remain a shark or will become plankton. I found out that summer I would become plankton. My dreams of playing principal oboe for Arthur Fieldler and Leonard Bernstein came crashing to the ground when my oboe instructor at Interlochen asked me "so, what do you plan on doing with the rest of your life?" and then proceeded to laugh when I told him my Plan A. Now, before you get all indignant about that and think "how cruel, how could anyone do that? ", you should know that the world of classical music is one of the most cut throat careers anyone could try. Basically, there are about 63 orchestras in the world that play year round and provide full time positions for musicians. In an orchestra, there are two (2) full time oboists and one part-timer who plays as a third or plays english horn when the score calls for one. So, let's do the math here, 63 x 2 means that 104 oboists in the world are employed full time by a major symphony orchestra. Soloist oboes who make a living are even rarer (despite the fact that we are the instrument the whole orchestra tunes to, including the violin, there just isn't the call for solo oboists). So, that means that the opportunities to make a living playing the oboe full-time are pretty limited. Basically you have to be the best of the best of the best to make it. And guess what, my instructor at Interlochen was right, I wasn't the best of the best of the best. I was good (you had to be to get accepted to Interlochen) but I just wasn't that good. And I like to think that Dr. Krause saw that I just didn't have the temperament for the career or the stomach. I loved to play but I hated the stress that came from auditions and the pre-concert jitters. It literally made me ill. I credit Dr. Krause with helping begin to form "Plan B", he told me to not stop playing the oboe. To just play it for me and fun and if I really wanted to stay in music, find something else to do in the music industry. And you know what, he was right and I did...thus, the beginnings of my path to acoustical engineer and Plan B. But more on that later. This recipe uses the sponge method for a first rise followed by a second standard rise before you roll out dough for the rolls. Your sourdough starter should be well established as well to give the best results. Also, the temperature of the room you are baking in should be between 75 and 80 degrees. If room is colder, double the rising times. If kitchen is warmer, use a retarded rise method by placing dough in refrigerator (this method will take some watching of dough. expect 2 to 2.5 times longer on rises). This recipe is suited for either hand mixing or standing mixers. This recipe results in 15 - 20 good sized rolls with a tangy sweet taste. This recipe may be used to make cinnamon, gooey caramel or pecan caramel rolls (recipes for fillings are below). Combine the starter, the water and one half the flour (without 1/4 Cup held back in reserve) in a large glass or plastic bowl(Don't use a metal bowl as the starter will "react" to the metal). Cover loosely with plastic wrap and let rise at room temperature for at least 3 hours or until almost tripled. Place dough in a very large buttered glass or plastic bowl. Cover loosely with plastic wrap and let rise for 8 - 12 hours or until at least doubled or almost tripled. Divide the dough into 2 halves and cover the half not being worked with plastic wrap and return to bowl. Turn the half of dough you are working with onto a floured surface for rolling and form into rough rectangle. Begin rolling dough out to form 15" x 6" rectangle that is about 1/2" thick. If dough springs back as your rolling use your hand to press into rectangle and roll out slowly. You will depress air pockets out of dough and the dough will be slightly resistant to rolling. You may also have to let dough "rest" and relax between some rolls for a minute or two. Be patient, dough will relax. Also, be careful to not overwork the dough or add too much flour as you are rolling. the 1/4" long edge border without filling. Brush water or an egg white wash on this 1/4" and seal the roll; gently pinching the roll to seal if necessary. Using dental floss, cut the long roll into 1 1/2" - 2" sections and place in well buttered 13" x 9" glass baking dish. Cover baking dish with plastic wrap and let rise 8 - 12 hours or until rolls are almost doubled. Bake Rolls at 350 Degrees for 45 minutes or until internal temperature of roll is 190 degrees. Let completely cool (1 to 2 hours) and frost. Note: If you make the gooey caramel or caramel pecan rolls, the caramel will set. To loosen from dish, set baking dish in pan of hot water for a few minutes before serving. These two rolls are also best served a bit warm. About 20 seconds in the microwave is about right to make them warm but the fillings not too hot. Also, don't try and halve this recipe. If it makes too many rolls for you, just bake them and freeze them without frosting them. When you want a gooey roll, take a few out of the freezer, let them come to room temperature and frost them. Despite the best of intentions to blog over the holidays, I see I failed miserably. Oh well. The holidays at our house aren't the high stress affairs that most people despise but seem to find themselves unable to avoid. This is probably because MBH refuses to have anything to do with Christmas or any of the ever increasing number of "holidays" that are foisted upon us at the end of the year. Normally, I will do a minor decking of the halls; decorate a small artificial tree with my favourite ornaments, put a seasonal (read: non descript) wreath on our door, and put out my favourite pieces of my Dickens Village. This year, I decided to not even do that. Partly because I just didn't really get into the whole spirit of the season and partly because I knew that I was going home to Northern Michigan on the 26th to visit my mom and dad and didn't want to have to pack up the decking material. I knew my Mom would have the cottage, where my brother and I would stay (oh boy), and their house decorated to the hilt and she didn't disappoint us. Northwest Airlines could have landed a 747 using our house as a beacon to the airport. I'm pretty sure the local Ace Hardware didn't have any lights left based upon what my dad had put up on the house. The Griswold’s have nothing on my folks. Minus the hassle of flying during winter from one delay susceptible airport (BOS) to an even more delay susceptible airport (TVC), it was one of the best holidays I've had in many years. Basically because for the first time in about seven years, my brother and I were both at home in Michigan at the same time and, despite neither of us were traveling with our respective better halves, I was looking forward to catching up with him and hanging out. Normally our trips home in Michigan don't coincide. This year we made an extra special effort to make it a whole family affair seeing how after 25 years of living in Florida during the winter my grandparents have returned to live in Michigan full time. With the exception of one set of cousins, all the cousins were together for the first time since we all turned "legal drinking age" and we sure had fun drinking together for the first time!! The best part though was seeing my grandfather surrounded by his family. He has had to move back to Michigan to be close to the family due to health reasons and having just had to watch his wife of 20 years need to go to a nursing home it was important that he have a really wonderful holiday. I will cherish this Christmas for the rest of my life. My trip home has raised a few questions though: Is it too late, at 38, to return your brother for a full refund? (just joking here) How is it, despite our best efforts, we do become our mothers? Why does it seem the tree is smaller than I remember? And what happened to all the really cool presents like the Barbie Ski Lodge and the Weeble House?